Senior Head Master Miranda Salazar announces the winning teams at the awards ceremony Sunday night. In keeping with tradition, the Great Midwest Trivia Contest LIV occurred this past weekend from 10:00:37 p.m. on Friday, Jan. 25 to midnight on Sunday, Jan. 27. These 50 hours were filled with competition, action challenges, random facts and, of course, trivia. The contest was organized by Lawrence students who are referred to as Trivia Masters. Students auditioned for the position of Trivia Master in fall term, and the Head Master was chosen at last year’s closing ceremony. This year’s Head Master was senior Miranda Salazar. Prior to Friday, campus was covered with posters amongst other forms of advertisement encouraging people to play. In the Steitz Hall Atrium, small plastic babies could be found dangling from the ceiling to promote Trivia. Plastic chrome babies were a common theme for this year’s contest. Students could also find a baby in their mailbox with the hopes of having a chrome one. Having a chrome baby gave teams an advantage, for they were worth points. Having new players on teams was also an advantage in terms of points in order to encourage people to involve new participants. 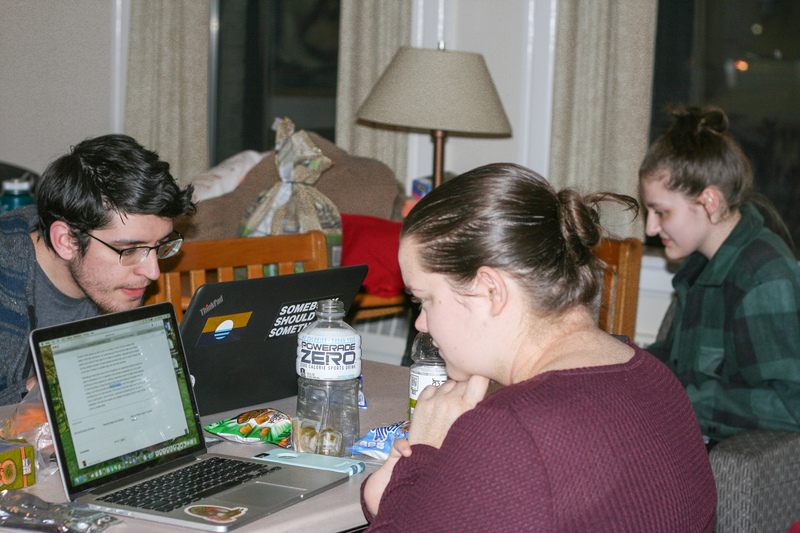 Although many Lawrence students were encouraged to play Trivia, anyone anywhere was able to form a team and participate. The long, multi-faceted questions were asked over the WLFM radio station every five minutes, allowing teams three minutes to find the answer using any means. Once a team stumbled upon what they hoped was the correct answer, they then called in to report their answer. Each call was allowed three guesses, but teams could keep calling since they did not have to identify what team they were with until they answered correctly. Trivia Masters, as well as volunteers, answered the phones for the 388 regular questions. This year there were technical difficulties with calls getting through, in which the possibility of cancelling the contest was spoken of. However, the Trivia Masters decided to persist through the difficulties and the issues were resolved by a few hours into the contest. There were also 24 canisters hidden around campus with action challenges inside, and even more challenges were read on air. Action challenges included, but were certainly not limited to, beating sophomore Trivia Master O’Ryan Brown at pool, throwing a birthday party for senior Trivia Master Emma Hancock and appeasing the Head Master. The pool challenge against Brown became even more intense when sophomore Grace Foster showed up in a swimsuit and challenged him to a race in the Wellness Center pool instead. Foster proceeded to win both the race and the game of pool that followed. This long name fit in with Trivia culture, as some people call it. Traditions for Trivia include long team names that are often reworded slightly to be relevant to the answer to the question when the team name is read on air. The rock outside of Main Hall is also generally involved in some way. This year it was painted chrome to reflect the theme of speed. 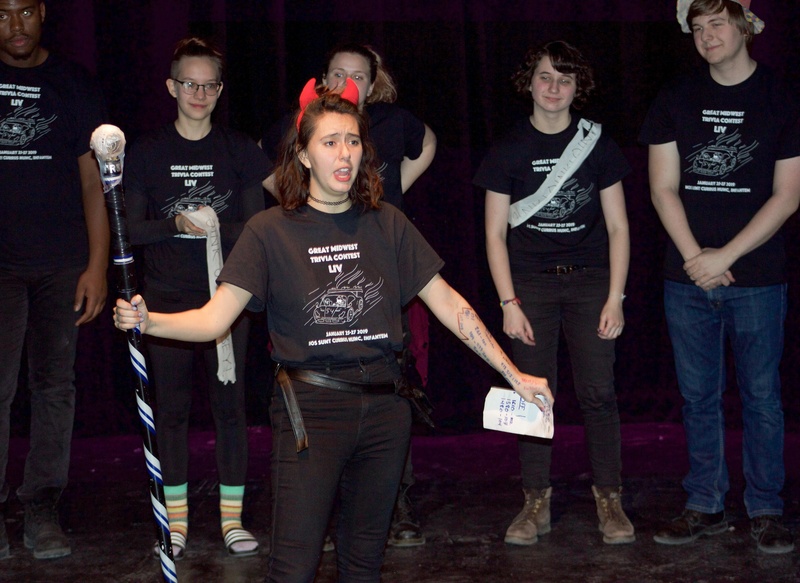 After 50 hours of Trivia, a closing ceremony was held in Cloak Theatre where prizes were given to the winners, and the new Head Master was announced. Next year’s Head Master will be junior Allegra Taylor. When asked about his experience on “Do You Really Trust an Aquarius…” sophomore Andrew Stelzer admitted, “It all feels like a dream now. I’m not sure if it actually happened.” Stelzer quickly added, “Play trivia! It’s awesome,” as he continued to remember the events that took place over the 50-hour contest. Members of the team “Coming Out of the Cave and the Nips are ROCK Hard” searching for answers to a question.